What is it that makes me want to beat my brother and sister at everything we do? It doesn’t matter if it’s a game of four square, or who can annoy father the fastest; there is an inherent rivalry between us. From athletics to academics, the three of us are constantly vying for supremacy, comparing our skills and awards to try to determine the most superior child. Fortunately, I’ve had more years of life experience than them, so I’ve been able to maintain a steady dominance. 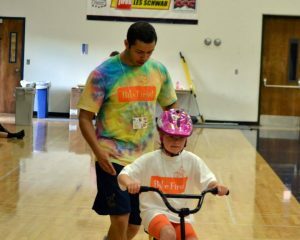 Let me explain: my brother is only in town for one week—this week—and for these six days he gets off from being in the military, he signed up to volunteer at Bike First (a day camp that helps teach mentally challenged kids to ride two-wheel bicycles). Every day of his “leave,” he, along with my sister, are helping out the less fortunate for eight grueling hours a day. Who do they think they are, trying to be better people than me? Just because I don’t like to wake up at 6:30am every morning, run around a gym for eight hours, bring smiles to children’s faces, incite love and pride in parents, the two of them think they can show me up like that? Well let me tell you, it’s all for show, ladies and gentlemen. It’s all about the facebook pictures he and my sister can now post to make them appear like better people.